HomeSpun Websites is committed to the development and growth of your business. We lay the foundation for prosperity, and support your success with a website that expands with you. Our success is measured by the success of our members. We are here to build a long term relationship with each member. Whether you are sole proprietor who is just getting started or a large established company, HomeSpun Website can help you grow your business through our expertise in web development and internet marketing. It's fun, easy and affordable! Choose from a wide array of designs and colors, then watch your website develop before your eyes! Since the HomeSpun Website Builder is accessible through your web browser, there are no downloads or special software to buy. If you are comfortable using simple computer applications like creating a Word document or writing an email, you will be comfortable building your HomeSpun Website. Plus, our packages are so reasonable that even the smallest businesses will be able to have a beautiful website. Perhaps you don't have the time or inclination to build your own website, or your business requires advanced features, in which case HomeSpun will build it for you. We have several options we're sure you will love. 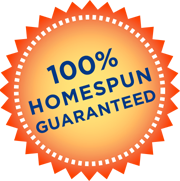 Put your faith in HomeSpun to build you the "Perfect Website." Easiest Web Builder on the plaNET! HomeSpun makes it possible for anyone to have and maintain your own website. We set up the framework and give you the tools and know-how to add pages, text, images, links and maps with just a few clicks of your mouse. A HomeSpun Website is perfect for all types of businesses, from dining-room table artisans to freelance writers, attorneys, real estate agents, restaurants, vacation rentals, to mom and pop industries and start ups. The Bamboo Grove Hawaiian Grille has nothing but good things to say about Homespun Websites! They quickly took our old website and reconfigured it. The transition was smooth as can be. The friendly staff was patient with my lack of knowledge and terms of the trade; and the end result is so much better looking and functional. Once it was in place I found it was very easy to make changes and add content. I love how I can go in at any time to update our current events! I highly recommend Homespun to help your company look great!